After my most recent trip to Thailand, I began to reflect upon the parallels in security between Thailand and Australia. It seems to me that Thailand faces a similar conundrum to Australia: its principal security ties are with the United States while its trading ties are increasingly dependent on China. For both Australia and Thailand the US ties are associated with significant capability benefits derived from information exchanges as well as modern equipment, procedures, and techniques. Both of our countries recognise there are sensitive aspects of their US-derived military capabilities that are not meant for others. Thailand also has a long tradition of deftly handling competing great power aspirations to protect its national interests, having successfully played off imperial France and Britain in the past.Thailand, like Australia, has a sufficiently diversified and large economy to be able to withstand threats of economic pressure and make its own decisions based on its own national interests. In this sense, Thai practice might provide a useful yardstick for reflecting on defence-related options for Australia in its current dealings with China. Like Australia, Thailand has been an American treaty ally since the Cold War and has a vested interest in retaining strong and effective military ties with the United States. Much of Thailand’s military equipment, doctrine and procedures are drawn from the United States, reflecting over half a century of bilateral investment. Thailand therefore can ill-afford to act as if that legacy doesn’t exist, lest its extant force capabilities are unduly undermined. At the same time, Thailand has an interest in maintaining the relationship with the United States in order to avoid being subject to excessive pressure from China. But Thailand is being pressed to enhance its military cooperation with China. Thailand has purchased Chinese military ships, missiles and tanks before, but has been disappointed with their quality and is wary of being overly committed to Chinese hardware. In addition, the Thai military is heavily invested in using English, the language of ASEAN, rather than Mandarin. Still, a growth in occasional bilateral military projects withChina can be expected. China wants to learn all about the US-derived tactics, techniques and procedures in use by the Thais, while offering little in return. In particular, China is interested in gaining a more detailed understanding of Thailand’s special forces and amphibious capabilities . This is due in part to China’s recognition that enhanced special forces and amphibious capabilities are a necessary prerequisite for the development of more robust Chinese force projection capabilities: that’s what will be needed if China intends to seize and hold any more of the disputed islands in the South China Sea and the islands near Taiwan. On this, the signs have become increasingly ominous. In terms of the region’s broader dynamics,Thailand, like Australia, has become increasingly concerned about China’s assertiveness over regional disputes. China’s willingness to ignore the attempts at collective bargaining by ASEAN and to apply undue pressure bilaterally to the individual countries with which it has territorial disputes in the South China and East China Seas has shaken confidence at China’s claims to benign intent. Thailand has looked on aghast at how China has co-opted Cambodia in a way that has undermined the cohesion and effectiveness of ASEAN. The Thais’ concern springs largely over fears for the well-being of ASEAN. A strong and unified ASEAN is something both Australia and Thailand see as in their national interests. For Thailand, ASEAN solidarity leads to a greater voice on the world stage. For Australia, greater ASEAN solidarity points to greater regional security and stability which implies better trading opportunities and a lesser need for defence funding as a hedge against increased security instability. 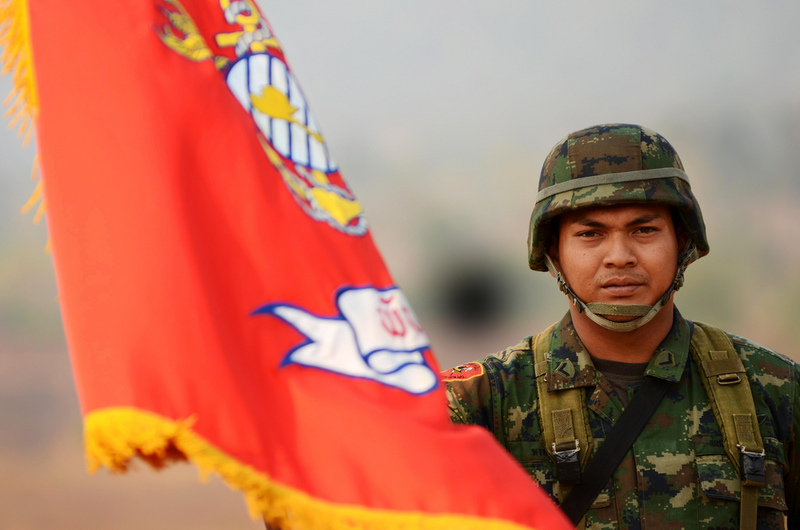 Thailand is feeling the pressure to increase military engagement with China even if it is at the expense of its relations with the United States. But the Thais recognise that they are best served by taking a different approach to that of neighbouring Laos and Cambodia. They have a bit more latitude because, unlike these countries,Thailand has no border with China. Therefore Thailand is in a position to be more proactive towards the west—and the United States in particular—because there’s less risk of direct confrontation with China. Like Australia, Thailand sees the enduring benefit of keeping strong working relations with the US military, while at the same time looking to foster moderate and carefully calibrated but still meaningful military engagement with the Chinese armed forces as well. In the meantime, there is scope for closer collaboration between the Thai and Australian armed forces, including alongside US and other regional security partners in exercises such as the largest regional multilateral exercise that is focused largely on humanitarian assistance and disaster relief held annually in Thailand known as Exercise Cobra Gold. John Blaxland is a senior fellow at the Strategic and Defence Studies Centre at the Australian National University. He has recently returned from a study trip in Thailand. Image courtesy of Flickr user DVIDSHUB .